Major League veteran Kevin Frandsen was suspended Wednesday after testing positive for a banned substance, according to the Commissioner's Office. Frandsen, a well-traveled infielder who has seen time in the Majors each of his last five seasons, received a 50-game suspension after testing positive for Ritalinic Acid, which is considered a performance-enhancing substance in violation of the Minor League Drug Prevention and Treatment Program. Frandsen, who homered yesterday for Triple-A Lehigh Valley, will begin serving the suspension immediately. Ritalinic Acid, or Methylphenidate, is a psychostimulant drug commonly used for treatment of attention-deficit hyperactivity disorder. The drug stimulates the central nervous system, helping to increase alertness and combat fatigue. Frandsen signed a Minor League contract with the Phillies on April 1 after the Angels declined to offer him a 2011 contract in December. 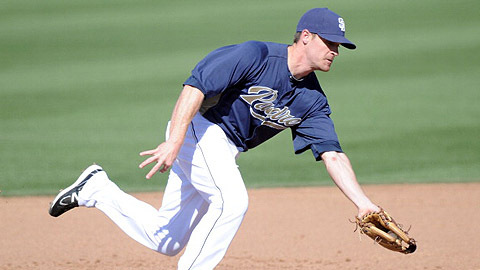 He went to Spring Training with the Padres, who released him on March 25. The 28-year-old was batting .321 with three homers and 18 RBIs with the IronPigs, the Phillies' top affiliate. The Los Gatos, Calif., native appeared in 54 Major League games last season with the Angels after spending time in the bigs with San Francisco from 2006-09. He's played in 228 Major League games in his career after the Giants selected him in the 12th round of the 2004 Draft out of San Jose State University. The former Futures Game All-Star won the 2006 Dernell Stenson Sportsmanship Award in the Arizona Fall League, an honor bestowed on a player who "best exemplifies unselfishness, hard work and leadership." Major League Baseball also announced the suspension of a free agent Minor Leaguer, outfielder Joe Dickerson, who received a 50-game suspension after testing positive for an amphetamine. The suspension of Dickerson will be effective immediately upon his signing with a Major League organization. Dickerson was the Royals' fourth-round pick in 2005 and last appeared in the Minors in 2009 with Double-A Northwest Arkansas. He spent last summer with an independent league club. Frandsen is the fifth Phillies farmhand and Frandsen and Dickerson are the 23rd and 24th players to be suspended under the Minor League program in 2011.